Big league dreams got a real-life workout on Tuesday when Busch Stadium hosted 100 young baseball and softball players from the Belleville Khoury League. The boys and girls took batting practice, stretched in the outfield and ran the bases. The event was sponsored by the PLAY - Promoting a Lifetime of Activity for Youth - campaign, sponsored by the Professional Baseball Athletic Trainers Society and the Taylor Hooton Foundation. The group visits with local youngsters at baseball stadiums around the country each year to encourage physical activity and educate them on the dangers of steroid use. 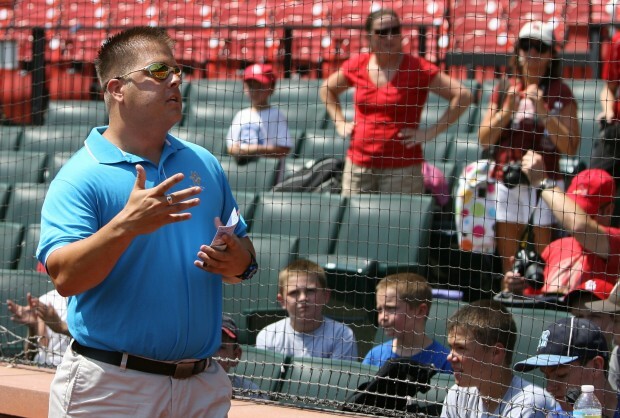 “We’re just trying to get kids active, and what better place than on the field, where they all want to run the bases,” said Cardinals head athletic trainer Greg Hauck. Organizers said not all baseball stadiums allow the kids on the field. But the Belleville teams had the run of the outfield grass, the infield dirt and even the water jugs in the dugout. Zachary’s dad, who shares his name, said it was a thrill to watch the kids in action at the park. Still, “It would have been better if it were me,” the senior Zachary Hamilton said with a smile. As part of the day’s events, the kids gathered in the stadium seats to listen to Donald Hooton Jr. talk about his brother, Taylor, an aspiring baseball player who committed suicide in 2003 at age 17 after using steroids to try to gain size and strength. Hooton listed the various side effects of steroids, including heart disease, stunted growth, hair loss and breast growth in men. “A lot of things you do to your body you can’t get back, just like I can’t get my brother back,” Hooton said. Cardinals infielder Matt Carpenter tossed baseballs to the kids in the indoor batting cages. “He doesn’t use batting gloves - that is manly,” said Belleville pitcher and third baseman Alan Mason, 8. All of the young players were given tickets to that night’s Cardinals game against the Los Angeles Dodgers. For them, it would be the second in a doubleheader.